Your little guy will be the talk of the party when he arrives wearing this adorable royal blue boy tie set! 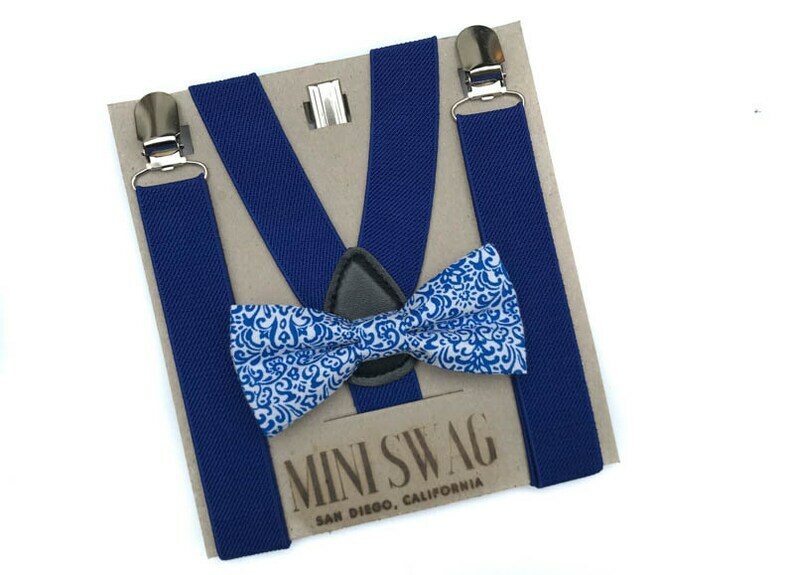 These suspenders and coordinating royal blue floral bow tie are perfect for a ring bearer, cake smash outfit, 1st birthday outfit, wedding, family photoshoot or other special occasion. This 100% cotton bow tie is double layered and reinforced with interfacing so it will hold its form well. The bow ties come in 2 attachment options- on an alligator clip (best for squirmy little guys) or an adjustable elastic neckband (best for older kids). See images. The fully adjustable royal blue suspenders come in multiple sizes and are made with extremely stretchable elastic for a comfortable fit. The silver clasps easily attach to most clothing. COLOR SWATCHES- Worried this isn't your exact wedding color?? Send us a message and we will be happy to pop swatches in the mail to you. Sign up for the COOL KIDS LIST for exclusive sales and a 10% discount code! Exactly what I asked for. I made a mistake on my order and owner immediately fixed the issue. Perfect suspenders and bow tie for my little man’s smash cake session!! Very helpful staff as well!